I am officially a hater of Tuesdays and Thursdays. Not through any real fault of the days themselves, but rather due to 7 1/2 hours of class followed generally by about 2-3 hours of work. Today’s stress load was only exacerbated by the fact that I found out about a semi-large homework assignment only hours before it was due (leaving me literally only about an hour and a half between classes to complete it), the fact that I got six points marked off an “Opportunity” (the Education Department’s laughable new jargon for an exam) that shouldn’t have been marked off, and a particularly depressing group activity in my second-to-lass class, when I was placed with two of the most dominant personalities in the classroom. Any one of these things would not have been a big deal on any other day, but Tuesdays and Thursdays just can’t hold much more stress than they already do–it’s like shaking up a Dr. Pepper bottle right before opening it and hoping it won’t explode: it just doesn’t work. Something had to be done. I came home a cranky mess, with a buzzing brain and a serious craving for ice cream. Matt said he wanted a Fat Boy. So we cooked up a plan–in the fifty-five minutes left to us before our dinner group started, we would go on a high adventure out to Richmond to find the mysterious Fat Boy factory, which I’ve been hearing off and on for the six years I’ve been a Logan-ite. We set out to find it, without a map and with hardly more than an address. 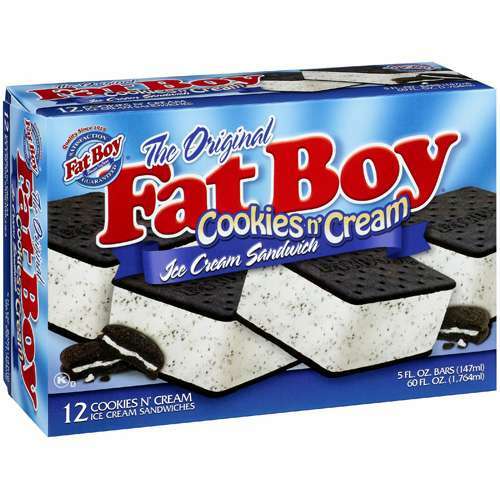 After a wrong turn that led us down to a bunch of cows, we finally found the mystical factory of fun and Fat Boys and bought ourselves a box of 50 Fat Boy rejects for only $14. Yes folks, you heard correctly–$14 (including tax). I now have 48 Fat Boys stacked back to missing back on our freezer door, just waiting for another no good, awful day (i.e. Thursday). So there you have it folks: the perfect recipe to destress your day–a whole lotta sugar and a really amazing bargain.